Story: From director Clint Eastwood comes "American Sniper," starring Bradley Cooper as Chris Kyle, the most lethal sniper in U.S. military history. But there was much more to him than his skill as a sharpshooter. 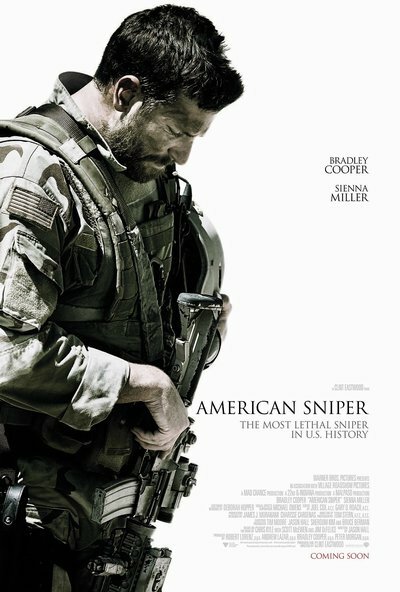 U.S. Navy SEAL Chris Kyle is sent to Iraq with only one mission: to protect his brothers-in- arms. His pinpoint accuracy saves countless lives on the battlefield and, as stories of his courageous exploits spread, he earns the nickname 'Legend.' However, his reputation is also growing behind enemy lines, putting a price on his head and making him a prime target of insurgents. He is also facing a different kind of battle on the home front: striving to be a good husband and father from halfway around the world. Despite the danger, as well as the toll on his family at home, Chris serves through four harrowing tours of duty in Iraq, personifying the spirit of the SEAL creed to "leave no one behind." But upon returning to his wife, Taya (Sienna Miller), and kids, Chris finds that it is the war he can't leave behind.